Morning clouds will give way to sunshine for the afternoon. High 64F. Winds N at 10 to 15 mph..
Saline County Sheriff Alan Moore (from left), Nebraska State Patrol Col. John Bolduc, FBI Special Agent in Charge Randy Thysse (at lectern) and Lincoln Police Chief Jeff Bliemeister announce developments in the disappearance of Sydney Loofe on Tuesday at Hall of Justice in Lincoln. A Nebraska State Patrol cruiser sits on the road to where law enforcement were apparently searching for evidence related to Sydney Loofe's death and disappearance Tuesday in rural Clay County. Authorities check tall grass and harvested cornfields near a rural intersection in Clay County as they search for evidence in the apparent death of Sydney Loofe. The 24-year-old was reported missing in Lincoln nearly three weeks ago, and police said they found remains Monday that are believed to be hers. Law enforcement personnel search a stretch of County Road 310 between Roads S and T in Clay County on Tuesday. Law enforcement personnel check out a stretch of County Road S in Clay County north of County Road 308 on Tuesday. Investigators said remains of Sydney Loofe were found in a rural area of Clay County on Monday. CLAY CENTER — Nearly three weeks after Sydney Loofe disappeared, law enforcement recovered a body they believe to be hers Monday afternoon in a rural part of Clay County, officials say. Loofe was reported missing Nov. 16, the day after family and friends said she went on a date with someone she met online. "We do believe that there is evidence of foul play," Lincoln Police Chief Jeff Bliemeister told reporters Tuesday during a 9 a.m. news conference at the Hall of Justice in Lincoln. Loofe, 24, was reported missing Nov. 16 after she missed work at Menards in north Lincoln. Police have said she was last seen the night before in Wilber, after apparently going on a date with a woman she met through the online dating app Tinder. Two people named by law enforcement as persons of interest in her disappearance — 51-year-old Aubrey Trail and 23-year-old Bailey Boswell, the woman she met online — remained in the Saline County jail on a hold for the U.S. Marshal's Service. The pair live in Wilber but left the state after Loofe went missing, and were arrested last week in the Branson, Missouri area. As of Tuesday morning, Trail and Boswell hadn't been publicly accused of any crimes related to her disappearance, but Bliemeister said both are still persons of interest. "We're continuing to speak with Aubrey Trail and we'll continue to do so as long as he's willing to do that," the chief said. Law enforcement had spent much of the previous week scouring rural areas outside Wilber and nearby Clatonia. But analysis of involved individuals' "digital footprint" led to the search in rural Clay County, where Bliemiester said the body was found in a wide-open area. On Tuesday, as many as 40 law enforcement officers were working in an area southeast of Clay Center, about 50 miles west of Wilber and 70 miles southwest of Lincoln, in southeast Clay County. Loofe grew up in Neligh, where her father is the high school principal and her mother a resource teacher for the school district. At Neligh-Oakdale, Loofe played basketball, volleyball and golf and participated in band. She also kept statistics for the basketball and volleyball teams and participated in the school's one-act play, according to a Q&A Loofe did with the Neligh News and Leader in 2011. She graduated that year and moved to Lincoln a short time later as part of a transfer in her employment with Menards, her mother, Susie, said. Her two siblings lived in Lincoln while they attended school but moved to other cities after they graduated. Sydney Loofe communicated with her parents via phone call or text three or four times a week, which helped keep them in touch being a three hours drive apart, her mother said. In Lincoln, Loofe worked as a cashier at the Menards at 27th Street and Cornhusker Highway, and was known by her friends and coworkers as polite, always caring and willing to do anything that was needed. "She's the kind of person the world needs more of," her friend Terra Gehrig said. "She has a very good heart." Loofe liked Lincoln but was looking to change jobs, her mother said. In her free time, the outdoors lover enjoyed fishing. Loofe loved animals and raised her cat Nimzy since she was a kitten, her mother said. Nimzy was still at Loofe's home in Havelock on Nov. 16, the day she didn't report to work and her family reported her missing. That struck her mother as odd. "She wouldn’t leave her cat,” Susie Loofe said Nov. 20. "She was planning on coming home that night. Everything left in her house, points that she was." Social media have opened a window into law enforcement's search for Sydney Loofe in a missing persons investigation unlike any authorities have worked in the past, a former FBI special agent said this week. 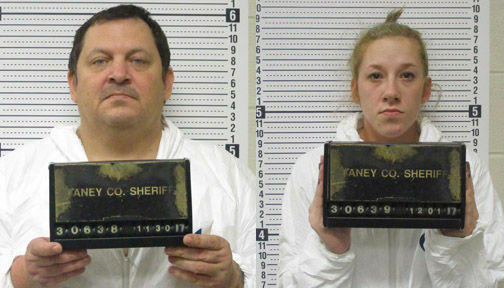 Two people identified by law enforcement as "persons of interest" in Sydney Loofe's disappearance remained in custody Friday, now at the Saline County jail in their hometown of Wilber.